Why Declutter Before You List ? When REALTORS® talk to you about buying real estate, they will use the word “home.” If they are talking to you about selling your home they will refer to it as a “house.” WHY? because when we are purchasing we are thinking about living in our new home, we are emotionally involved. When we sell real estate it is time be detach. You need to think of your house as property. AN Asset. Real estate. You want Buyers to see it as their new home, not yours. The first step is to depersonalize the house. Remove family photos from the wall, let the buyer use their imagination and see their pictures hanging there. It is also a good idea to pack up trophies, souvenirs, collectible items, knick knacks and the like. You may need to rent some storage space but it is worth it. No, the garage is not a good place to stuff things nor closets. If the closets are stuffed full it looks like the house doesn’t have enough closet space. This is a great time to have a garage sale or rent a storage space. Do not start storing STUFF in the garage or closets. 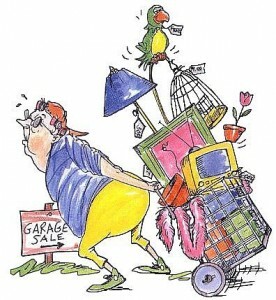 A very important part of getting your house ready to sell is getting rid of “clutter” . This is hard for most people to do. It is hard to identify your own clutter. Twenty-five of your child’s finger paintings stuck to the refrigerator is a treasure to you but to others it is clutter. Visit some open houses on a Sunday afternoon with a critical eye for clutter then go home and look at your own house with the same critical eye. Have you used every inch of your counter space. Are your counters the final resting place for all your appliances? That, in the eyes of a buyer is clutter. To the buyer it looks as though there isn’t enough counter space. Put all the appliances away and take them out as you need them (put them away when you’ve finished). No room in the cabinets for all those appliances? Good thing you rented that storage space!!!! That is all I have to say here. I think by now you get the point. If something is crammed full, empty it out.